In the same 30 minute session you would spend at a demo day focused on one brand you can get fit for every brand. Find out which brand works best for you and compare back to back. Most importantly get fit with the same brand golf balls you play with and not range balls that do not fly or spin the same as the golf balls you play. The technology is finally here! The most accurate tool in Ball Launch Analysis Technology is now available. GC4 uses the most advanced techniques to gauge the exact speed, backspin, vertical angle and side angle of every shot. To do this, the digital system uses high quality optics and an exact timing system with accuracy of less than one micro-second. By locating the center and the spin markers of each ball image, it calculates the speed and direction of the ball flight, spin rate and spin axis. King of Clubs uses this along with numerous other tools listed below to obtain accurate measurements of your swing characteristics. Obtaining correct and accurate data is the initial stage of building your clubs. 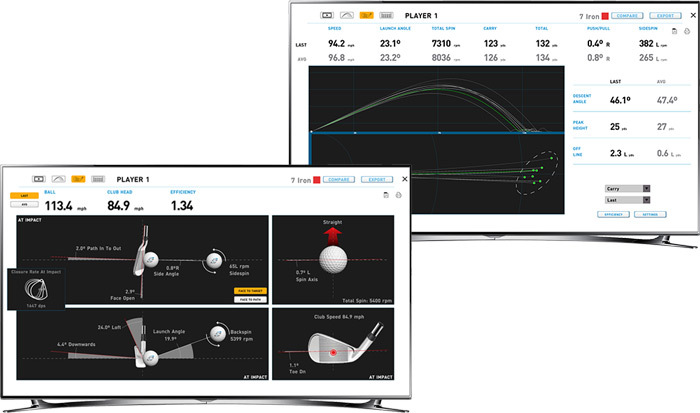 Most club fitter now use ball data to collect info about your swing. It is crucial to use real golf balls when gathering this info. using range balls will result in inaccurate data. You don't play golf with range balls why would you get fit with range balls? Your game is on the line, Don't settle for less. Realistic projection makes you feel like you are on the course while we gather unique information about your swing. Remember custom fitting is only one-half of the procedure. At King of Clubs we not only custom fit you with the most advanced systems available we also build a club specifically for you using raw components from our heavily stocked inventory. Don't settle being custom fitted and then receiving a mass produced "off the rack club"